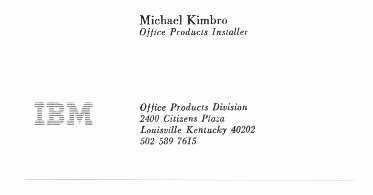 The resume of Michael D. Kimbro of Louisville, Kentucky. In search of regular hours and higher pay, I'm now a purveyor of auto parts in the South End of Louisville. Settling into my new Kentucky home, I was a sports shoe consultant (aka shoe salesman) in the East End of Louisville. The brands of shoes which I sell include ASICS, New Balance, Mizuno, Saucony, Brooks, Hoka One One, ADIDAS, Altra, and 361, along with Chaco brand sandals, and boots by Hi-Tech and Dunham. 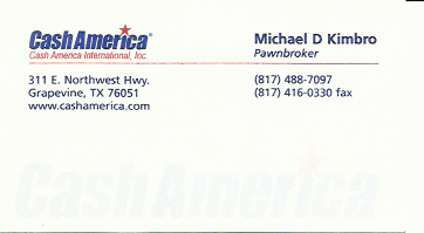 A pawnbroker at Cash America Pawn Shops, which at the time was the largest pawn shop chain in the world. It's now a part of First Cash Pawn Shops. 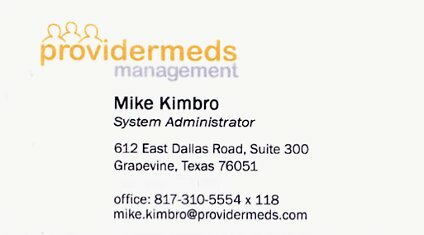 I was the first line on-site and telephone support person for the Microsoft Windows based automatic medicine dispensing machines which Provider Meds Management sells to the senior care industry, including nursing homes. Covering a territory which included nursing homes in Waco, Dallas, Wichita Falls, Mesquite, SW Fort Worth, and one just West of Sherman, I was on-call 24 hours per day, 7 day per week, 28 or 29 days per month. The hours were more than I could handle. This was compounded by the fact that, on the telephone, I simply couldn't decipher the strong accents of those nurses of foreign origin (usually Sub-Saharan Africa) which seemed to have made up the majority of the 3rd shift staff at the nursing homes which we serviced. This forced me to travel in the early hours to resolve many calls, under the pressure of knowing that the problems had to be completely resolved prior to the next run of medication packets, which usually took place around 6 AM. Also, the looming prospect of taking on nursing homes in Austin and San Antonio sent shivers down my spine. Eventually, the total lack of quality sleep time sent me into depression, so my attitude went to hell and "one day the axe just fell"...quoting from Bob Dylan's song "Tangled Up In Blue." 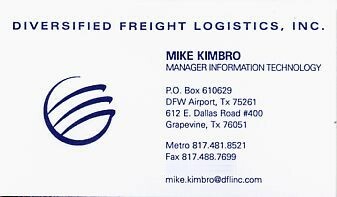 DFL was purchased in the Spring of 2008 by BNSF Logistics of Springdale, AR. 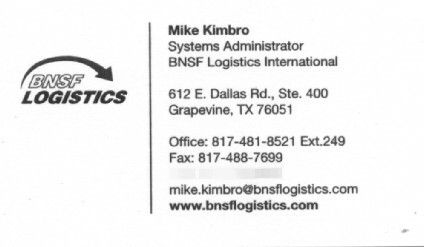 The name was changed to BNFS Logistics International, and I continued with similar systems administrator responsibilities, along with the task of integration of our MIS systems with the systems of the shipping lines and railways for receipt of ABI/EDI messages for purposes of shipment progress tracking. Made the move back into MIS thanks to the good folks at DFL. 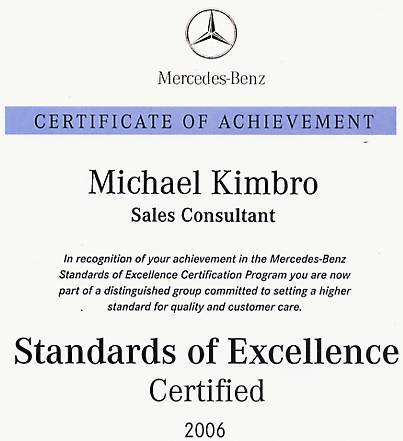 Making the conversion from domestic to import to answer the highest calling which a man can receive in the car business...to sell Park Place Mercedes-Benz automobiles. Working at a state of the art facility located on Lemmon Avenue just south of Dallas Love Field. 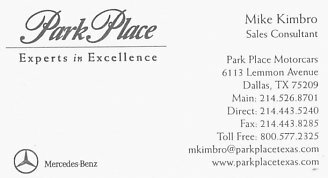 Serving Dallas County and nearby Highland Park, this Mercedes Benz and Porsche dealership is located just a short distance north of the Dallas Uptown and Dallas Oaklawn areas. Learning the car and truck sales ropes, while working with some really good people. Spent time in both new and pre-owned auto sales, as well as in the internet department. 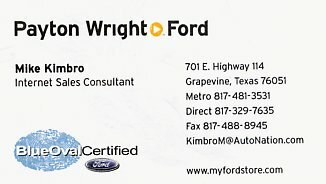 Earned Certification from Ford on new and CPO vehicles. 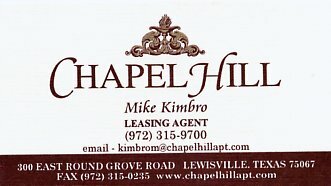 Leasing consultant at one of the premier communities in the Dallas/Fort Worth area. A working education of the multi-family property management industry through temporary assignments at numerous apartments across the DFW area. The firm's name then was BG Personnel Services. 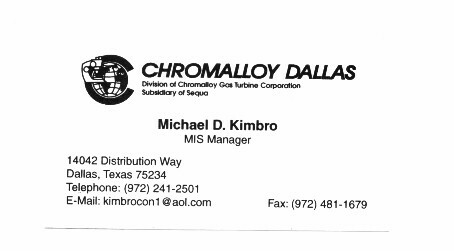 MIS Manager for this manufacturer of jet and turbine engine components, with just over 100 computer users scattered over five plants in North Texas and one in Mexico. Duties included installation of LAN and WAN throughout the organization, as well as the day to day oversight of the firm’s servers and IBM AS/400. As a member of the implementation team, assisted in the conversion of the firm’s manufacturing, distribution, and accounting software from AS400 to Y2K compliant LAN based platform. In spite of resistance from the HQ corporate staff ("Winframe, it's a product in search of a purpose! "), I installed and implemented a pair of Citrix Winframe Servers to permit trouble free running of our Symix Syteline applications at our four remote plants over high speed radio links. Our division was the first in Chromalloy Gas Turbine Corporation to implement Citrix Winframe (later called Citrix Presentation Server), and a year later it was on the corporate IT's list of recommended platforms. Provided on-site support for IBM System/36, AS/400, and PC based LAN accounts in Dallas/Fort Worth area, using my installation, performance tuning, and troubleshooting expertise in Remote Communications products (remote controllers, modems, and modem eliminators) as a entry vehicle into accounts. Specialized in both IBM and I/O Corp. products for LAN and PC connectivity. 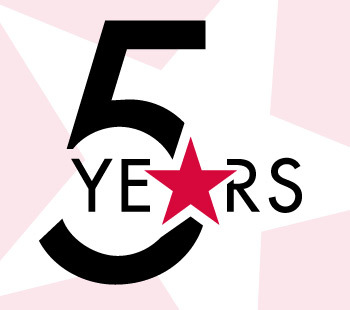 One of three founding partners in this computer integration company (along with Idaho's Don R. Rowe and England's Mark J. Littlefield) which initially "grey marketed" IBM AS400 Systems, then later moved to service the LAN and WAN side of the IBM Midrange marketplace. Moved to yet another firm which specialized in the "grey marketing" of IBM Mid-Range Systems. 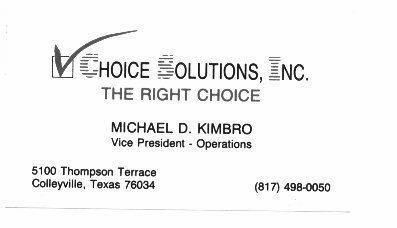 Responsible for coverage of IBM AS400, System36 and System/38 users in parts of Dallas, then later in the entire Fort Worth area. Assisted Anderson Consulting in the sale of XL Datacomp's XL/Mac Pac manufacturing software at Senisys in McKinney, TX. It was noteworthy because at one point during the sales cycle the Senisys CEO--responding to a highly polished "trial close"--personally kicked the entire sales team out of the building. XL/Datacomp, a Hinsdale, IL company, folded for 2 reasons. True, IBM pulled our "business partner" status due to our gray market activities. But the bigger reason, and the one which pushed me out, were the yearly sales plan reductions. But I can't say I wasn't warned very early on, as Mr. Tom Owens, Sr. himself gave a presentation in which he described how he started the company, hiring a teacher as his first salesman. Tom presented the teacher with a compensation plan, and it convinced the gentleman to abandon his teaching career. Then, just as soon as the salesman got a taste of success, Tom called him in to restructure the sales plan so that Tom won't have to pay as much, knowing the teacher couldn't go right back to teaching. BTW, two details worthy of note: 1. During all of this, Tom was still a manager at IBM. 2. Prior to the hiring, the teacher was one of Tom's personal friends. Oh yeah, Machiavelli would have been proud. So, the company's basic strategy of increasing profits by reducing salesperson compensation was clearly revealed to ALL the sales people at XL/Datacomp. We didn't take old Tom's warning seriously, and we paid the price. Literally. During this period, the industry standard sales plan provided for commission of 20-30% of gross profit on a hardware sale. The XL/Datacomp management team, including Executive Vice President Michael LaForte, lowered commissions on the SALE of a computer hardware product from 19% of profit when I joined in 1989, down to 15% in 1990, a 21% reduction. But all was not lost, as the sales force assumed that management would have to restore commissions back to 1989 levels, or even higher, since IBM was pulling the plug on the AS/400 resale relationship. But what actually happened was a further reduction to 10% of gross profit on hardware sales for 1991. Doing the math: 15% to 10% was a further 1/3 reduction. Incredible. I vividly remember the gut punch felt when the new sales plan was cheerfully revealed to us at the yearly kickoff meeting at Arizona's Westcourt in the Buttes in January of 1991. The computer savvy salesmen such as myself started putting feelers out just as soon as we returned home, while most of the others hung on until IBM formally cancelled the AS/400 reseller relationship a few months later. Initially brought on as administration manager due to my familiarity with IBM's administrative workings, then later promoted to Vice President - Operations. Moved over to the sales staff dealing with both new (gray market) and used IBM Midrange (System/34, System/36, System/38, and AS/400) computer hardware/software. Expertise was honed in the sales and installation of various IBM remote communications products (5251-12, 5294, 5394), and the associated modems, modem eliminators, and DSU-CSU products. 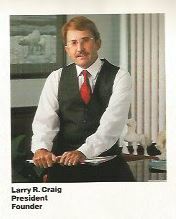 In 1986-1987, responsible for the sale of System36 based turnkey data processing solutions for wholesale distributors of finished goods, and well as the hardware representative in the sale of software artist Henry Munson's solution for U.S. Customs House Brokers and international freight forwarders. 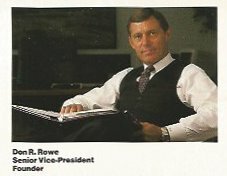 In 1988, the exit of former IBM Salesman Rush Greer opened the door for me to concentrate primarily in the sale of Bill Scott's IBM System/36 based "Jobber" software to petroleum remarketers (aka: petroleum jobbers) and convenience store operators in North Carolina, Maryland, Virginia, and Kentucky. 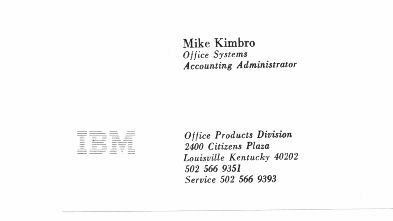 Forced to sell the software as well as the hardware, I traveled most of 1988 conducting seminars at the "IBM Customer Centers"...when I wasn't cold calling. I learned more about what is data processing (call it IT or MIS) during that one year than all the years before and since. 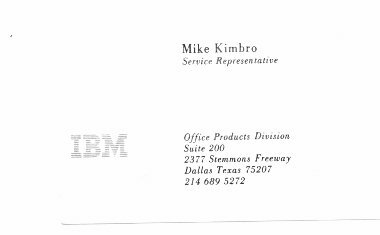 Transferred to Dallas, where I trained and worked as a “CE” (Customer Engineer) for IBM Office Products Division (aka: OPD). 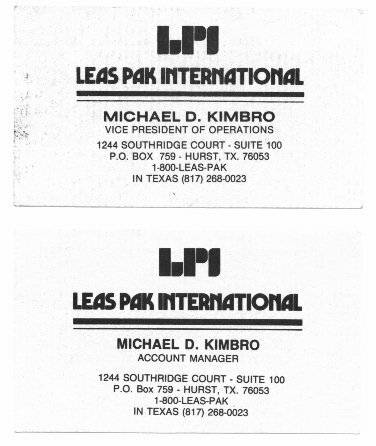 Products serviced included typewriters and dictation equipment, initially covering a downtown Dallas territory, and later a North Dallas territory. This is where I grew to love the on-site interaction with my customers. Held various administrative positions in IBM’s ‘OP’ and ‘OS’ divisions, including order entry, accounts receivable, supplies, and rentals. The secret to my meteoric rise at IBM...I married Debra Hillman, the boss' daughter. Installer for IBM Office Products (OP) Division Correcting Selectric typewriters and dictation equipment.